Amid partially unpacked boxes, Anjanette sat on a light brown armchair in the middle of her new one-room apartment in rural PA. The drive up to visit her had felt further away from Harrisburg than it really was – the tree-lined, winding roads through small towns and wooded mountains made the city seem like a distance memory. As a child, Anjanette remembers playing near a similar creek in eastern Pennsylvania. At the age of 5, she and a sister went to live with a large foster family in the area when her parents’ alcoholism prevented them from adequately caring for their children. Tragedy seemed to follow Anjanette through her childhood, striking first at the age of 7. Her older sister became ill with walking pneumonia and passed away two weeks later. This sudden loss left her feeling sad and scared. So, Anjanette poured her attention into protecting her younger sister and her other foster siblings. Six years passed and Anjanette remained at the same home, becoming more adventurous and active. She dreamed of going to college to become a phys-ed teacher! But, at 13, tragedy struck again: Anjanette learned that her biological father had drowned. Two years after that, at age 15, Anjanette’s biological mother was killed in a domestic violence incident. Shortly after, she and her sister, left the foster care system to live with their grandmother, but, understandably, this latest tragedy was too much for her to bear and Anjanette took her first drink at age 16. Before finishing 11th grade, Anjanette dropped out of school and continued to be dependent on alcohol. But this retreat was short lived because two weeks later, he showed up uninvited and stayed with the family in Pennsylvania. Alcohol, and now drugs, continued to drag both Anjanette and her boyfriend down to the point where her own sons were taken from her and placed in foster care. “That was devastating to me.” Thankfully, it was only for a short period of time, and Anjanette was able to get herself together enough to get the children back for the time being. 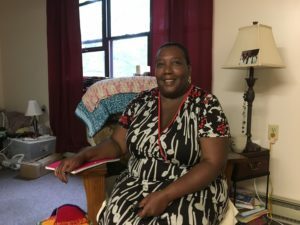 She can’t recall what gave them the idea to go to Harrisburg, but a couple years later, they had been put out of Grandma’s house and the whole family boarded a bus for the city. They ended up at Bethesda Mission. This first visit to the Mission was in about 1988 and the Men’s Shelter was able to accomodate them in an upstairs room for a night, then helped them get a motel room for a few more nights. After that, they bounced around to other shelters in the city, but drugs and alcohol, once again, brought destruction. From that point forward, Anjanette became singularly focused on getting her children back. 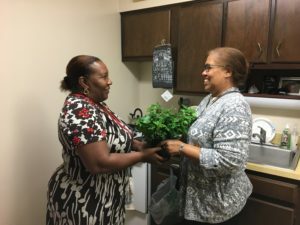 She went to the Harrisburg housing authority and was honest with them about her addiction. From there, she was referred to a detox program and continued to actively seek out help from various treatment centers in the city. She even got certified as a nursing assistant through the Red Cross, until her application was approved for housing. Equipped with her new job, new house, and new sober lifestyle, Anjanette was able to get her children back. But a new man came into her life, throwing her off balance, and she relapsed, yet again. At this point in her story, Anjanette needed to pause. Emotion overtook her as she remembered the pain, but the tears were mixed with profound gratefulness for being able to see how far she’d come. Battling addiction over and over again has clearly taken its toll on Anjanette, but she is also so obviously strong. Those years in the throws of addiction, recovery, and relapse can sound discouraging, but the persistence that she showed by continually picking herself up and seeking out treatment centers and rehabilitation centers time and time again is inspiring. Recovery takes work. In 2016, Anjanette felt that she had no more strength to recover. But with the little bit she had left, she made the call to Bethesda Women’s Mission. Anjanette continued, “My children are men now! I’m trying to figure out how I can still be a mother — I want to be a mother, sister, auntie, and grandmother. I want to be real — to have a real relationship with my grandchildren, sons, and siblings.” Anjanette has reconnected with her sisters and was happy to be able to share her love for the Lord with them as well. 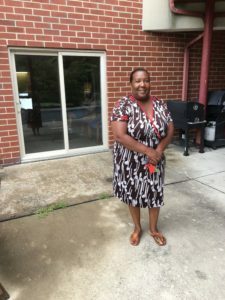 It was a major goal for Anjanette to secure permanent housing, which she just moved into a couple weeks ago. The apartment truly seems like a personal oasis for Anjanette – someplace she can rest.